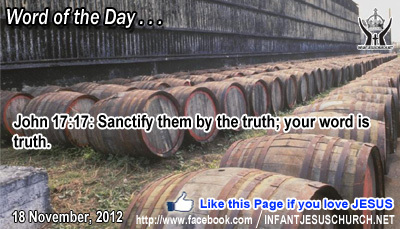 John 17:17: Sanctify them by the truth; your word is truth. Heavenly Father, give us a holy enthusiasm to know your truth and live it in both word and deed instead of criticizing each other. Help us to make correct opinion when we judge others. Make our life a reflection of your Word, who both proclaimed and lived your truth. In the name of Infant Jesus, we pray. Amen. 24 "But in those days, after that tribulation, the sun will be darkened, and the moon will not give its light, 25 and the stars will be falling from heaven, and the powers in the heavens will be shaken. 26 And then they will see the Son of man coming in clouds with great power and glory. 27 And then he will send out the angels, and gather his elect from the four winds, from the ends of the earth to the ends of heaven. 28 "From the fig tree learn its lesson: as soon as its branch becomes tender and puts forth its leaves, you know that summer is near. 29 So also, when you see these things taking place, you know that he is near, at the very gates. 30 Truly, I say to you, this generation will not pass away before all these things take place. 31 Heaven and earth will pass away, but my words will not pass away. 32 "But of that day or that hour no one knows, not even the angels in heaven, nor the Son, but only the Father. This story foretells the joy of God's kingdom - the joy of new life and the guarantee of a new age of peace and blessing. The signs of spring are manifest for all who can see. Just so are the signs of God's kingdom. The "budding" of God's kingdom starts first in the hearts of those who are open to God's word. Those who trust in God's word will accept the fruits of his kingdom. And what are the fruits of that kingdom? We don’t know the day or hour when the Lord will come back again in glory. But the Lord does give us signs, not only to "wake-us-up" as a warning, but also to "rouse-our-spirits" to be ready and keen to see his kingdom come in the entire power and glory. The Lord wants us to be overflowing with joyful expectation for his coming again. He surely comes to us each day and speaks to our hearts like a lover who speaks softly in the ear of the beloved. As Jesus promised, the Lord will certainly come again in all his glory. Do we look for the signs pointing to the Lord's come back and do we pray that he come quickly to establish peace and justice on the earth? Loving Infant Jesus, you are the Alpha and the Omega, the beginning and the end of all the past, and the lord of all conception. Give us joyful hope and self-confidence that we will see you face to face when you return in glory.